The Belly Dancer's undulating motion has been designed to provide optimal movement for the multiple stainings and washings involved in gel blotting techniques. The Belly Dancer's agitation is gentler but more efficient than the action of ordinary shakers and the platform tilt is continuously adjustable from level to sharp angles in seconds! 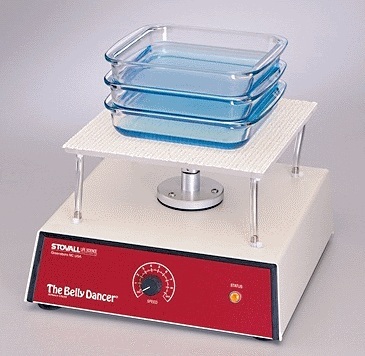 Constructed of chemically resistant materials The Belly Dancer will provide years of dependable general laboratory mixing use whenever gentleness is essential. This easy-to-install, second storey acrylic platform instantly doubles the platform capacity of The Belly Dancer unit. Supplied with 4.5" aluminum spacer legs and non-skid removable mat, this platform comes ready to install!